Charles Camilleri... 2014 champion driver. 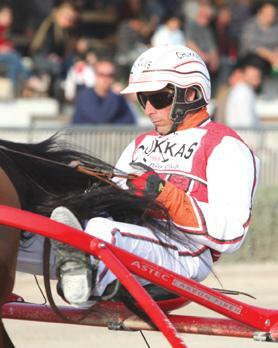 The 2015 horse racing season sets off on Sunday with an eight-race progamme for trotters at the Marsa Racetrack. All races in programme, starting at 1.30pm, will be over a distance of 2,140 metres. During the meeting, the Malta Racing Club (MRC) will present trophies to last season’s award winners. Charles Camilleri is the champion driver of 2014. The 42-year-old has established himself as one of the leading drivers at the racetrack. Camilleri, who was voted as best driver in 2004, 2005, 2006 and 2009, won a total of 39 races at Marsa last year. Kurt Saliba has retained the best youth driver award. In 2013, Saliba finished fourth in the annual classification for upcoming drivers before making the title his last year with a total of 12 victories. The champion jockey for 2014 is Michael Sultana. Widely considered as one the best local jockeys, the 26-year-old Sultana has claimed this prize for the fourth time following his successes in 2009, 2010 and 2013. Last year, Sultana won seven races from the 11 held at the racetrack. The MRC has also announced that the best trotter last season was Uranium des Arkads. The seven-year-old French standardbred, owned by Saliba, was registered in Malta on February 20, 2014. Uranium des Arkas won eight races in all, was runner-up once and third on another occasion in 12 races. Ollie Fliptrick was the top horse in flat racing last season. This 10-year-old US thoroughbred was registered in Malta in August 2010. Last year, Ollie Fliptrick, owned by Ritianne Gatt, obtained one victory in nine races. The MRC said that, in 2014, a total of 275 new horses made at least one start at Marsa which is a considerable figure, 35 more than the previous year. The indications are that this season is not going to be different, the club added. In fact, for the first two meetings of the season this month, 18 new horses are expected make their debut at the Marsa Racetrack.